Euastacus robertsi blends in perfectly with the rainforest. 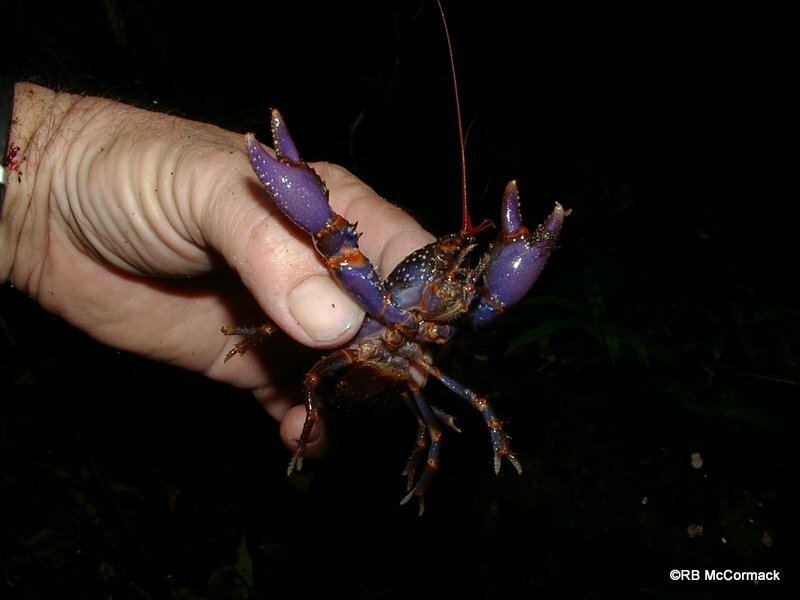 This is Australia’s most northern Euastacus species from the high altitude rainforests in very remote locations of far north Queensland. 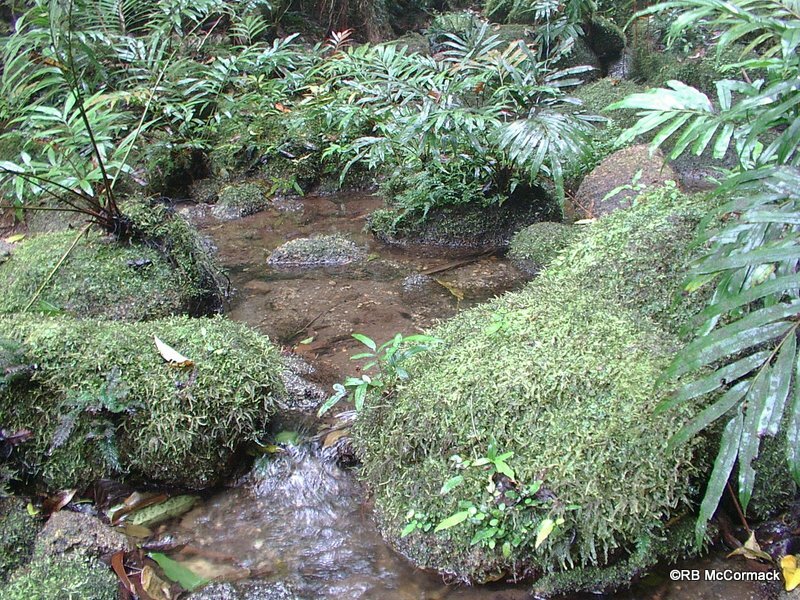 It is an intermediate group crayfish that prefers the clear flowing mountain streams draining the rainforests in these remote streams. In the 2011 Qld Survey season we managed an assault on Mt Finnigan. The first day we tried the western side of Mt Finnigan in tributaries of the Annan River. We managed to find tracks and trails up the side of the mountain and managed to get as high as 600m. The tracks left lots to be desired but I just sent Paul out ahead to clear the road whilst I listened to the radio. 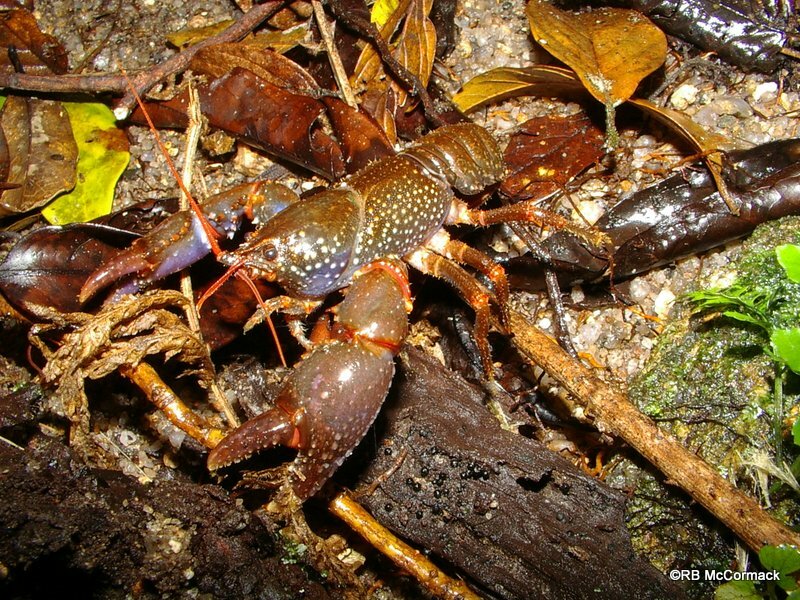 We surveyed a number of streams and tributaries but freshwater crayfish were absent. We were looking for Euastacus robertsi but expected not to find it at these lower altitudes but we did expect to find Cherax crays but they just weren’t there which was surprising. 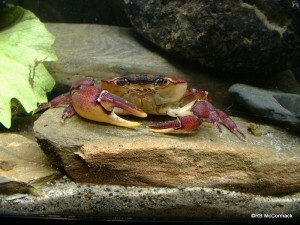 What we did find were freshwater crabs. Crabs are common at lower altitude but what was surprising was that this species infested the streams up to 600m. We don’t know what species they are but we send all our crab specimens to Peter Davie at the Qld Museum who is sorting them all out and will describe the new species. After a day searching the western side of Mt Finnigan we headed to the eastern side to camp the night. 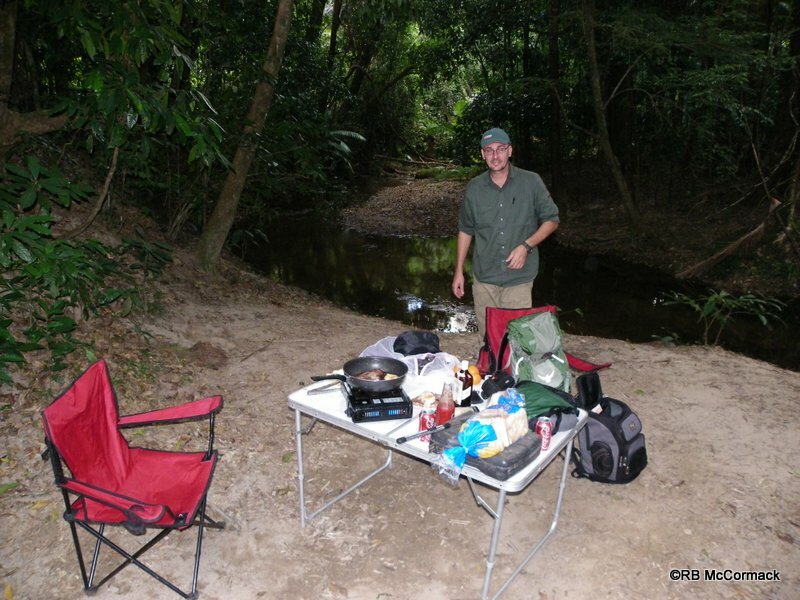 We have a great little spot we always camp on a clear flowing, mostly croc free stream that is just off the Bloomfield track. Mt Finnigan freshwater crab found as high as 600m. 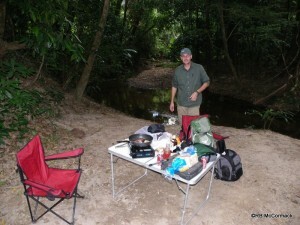 We camped the night but a tropical storm hit and torrential rain pummelled us most of the night. We set up tarps and tried to get some sleep. I finally abandoned the tent and headed to the car and managed a few hours sleep before a pre dawn start. That day started with damp conditions just the odd bit of drizzle. We had a hearty breakfast and then drove up the road to the base of Mt Finnigan, parked the car, kitted up and headed into the jungle for an assault up the mountain. It was still dark and the rainforest was pitch black so we hung around for half an hour till our eyes adjusted and there was a bit of light to stumble through the forest. 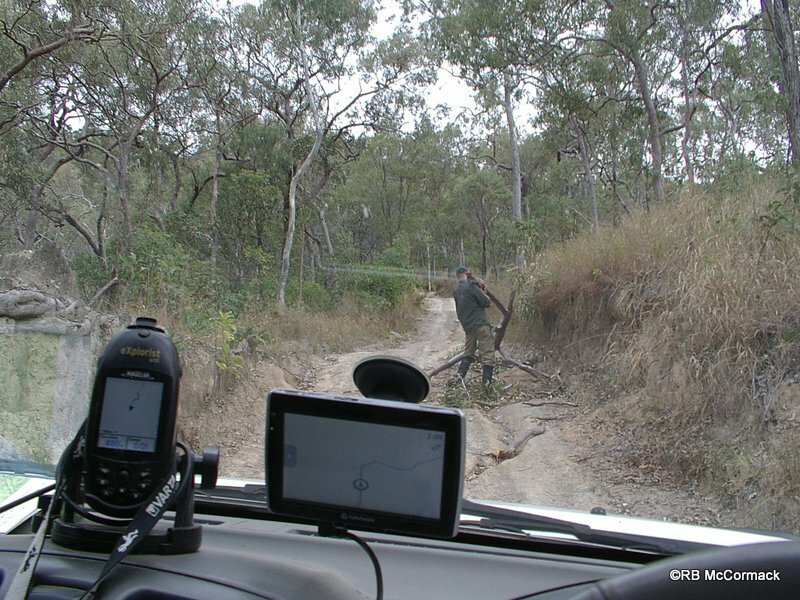 We had done this a few times before over the years so we had previous track logs on our GPSs and we knew where to head. There are no tracks or trails in this area and you really do need to be crazy to head up the side of a mountain in tropical Qld near Cooktown. The jungle is near impenetrable and it’s not friendly with just about every tree and shrub having stinging nettles, hooks, barbs or thorns. Everything is wet and slippery, it’s hot and steamy and we are in full kit with long pants, and shirts and carrying big packs climbing straight up 1000m. Add all the ticks, leaches and spiders and it’s a real adventure. Direct line its only 1.7km from the car that we are going but that still took us 4.5 hours continuous climbing without any breaks. We started encountering Euastacus robertsi at approximately 700 m a.s.l. 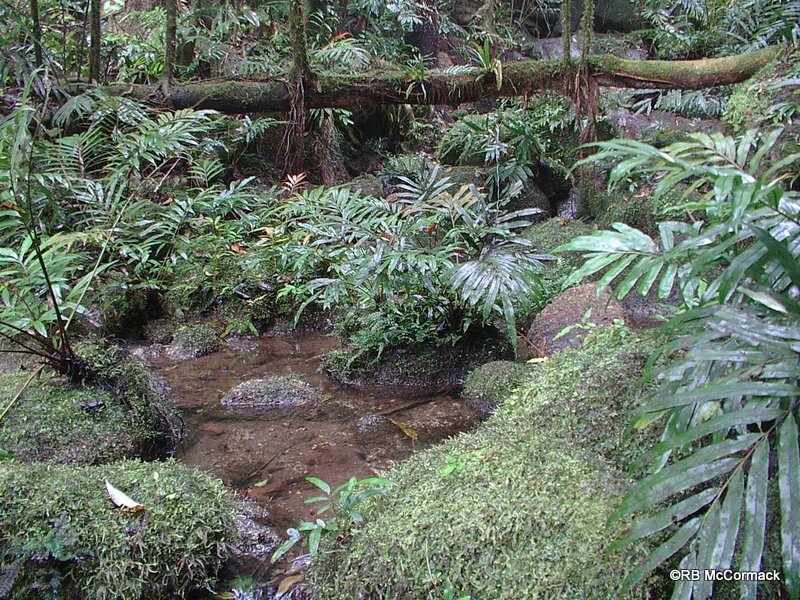 They were in rainforest shaded, clean, clear flowing streams and the only other species we encountered other than macroinvertebrates were Riffle Shrimp, Australatya striolata sharing the same streams. 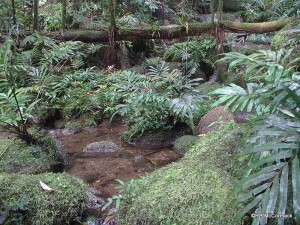 This was a small flowing rocky rainforest stream. Euastacus robertsi burrow within the stream under large rocks and into crevices and burrows mostly have a single entrance (occasionally double). 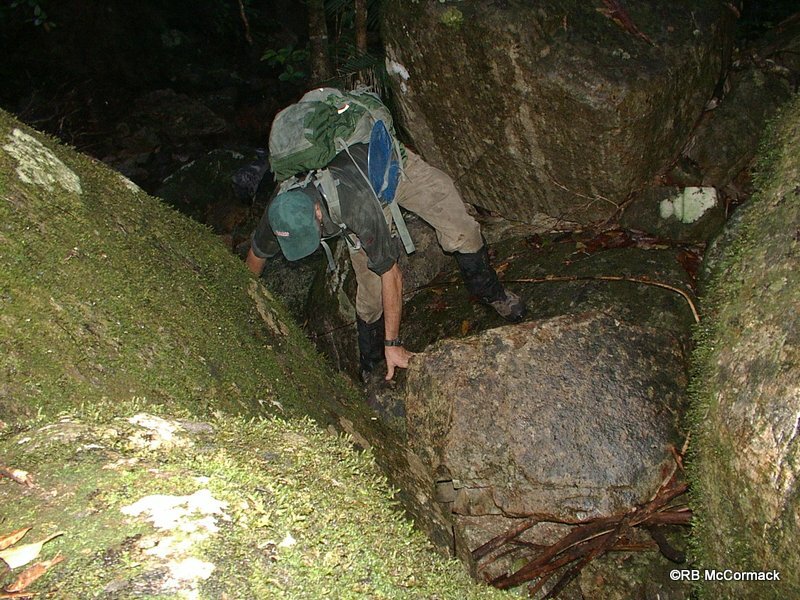 This is a rocky area and complete burrow excavation was not possible. No specimens were observed within the streams during daylight and we were unable to lure any from their burrows with bait. We spent most of the day searching the stream for crayfish and it was alarming just how few crayfish were in the stream. After a day up the mountain we stumbled back down to the car just before dark and headed back to our campsite.